Benjamin J Werner, 29, of Galloway was arrested by Ofc. Scott Winneberger for DWI on June 23. Edward Frost, 43, of Galloway was arrested by Det. Ryan Goehringer for aggravated assault and possession of a weapon for unlawful purpose on June 23. Eric P Salata, 26, of Galloway was arrested by Ofc. Przemylaw Ryba for hindering apprehension on June 24. Anthony G. Paolella, 29, of Galloway was arrested by Ofc. Bill Kline for DWI, failure to keep right and reckless driving on June 24. Hesmir R. Mejia, 23, of Galloway was arrested by Ofc. Scott Winneberger for improper behavior on June 24. Kevin Endicott, 28, of Galloway was arrested by Ofc. Scott Winneberger for possession of CDS on June 24. Jennifer A Bonomo, 36, of Pleasantville was arrested by Ofc. Kristian Magazzu for hindering apprehension on June 25. Tigh M. Williams, 22, of Atlantic City was arrested by Ofc. Scott Winneberger for possession of less than 50 grams of marijuana on June 26. John F. Brown II, 30, of Galloway was arrested by Det. Bryan Casey for possession of a weapon while committing a crime, possession of more than 50 grams of marijuana, manufacturing/distributing CDS, receiving stolen property, possession of a firearm for unlawful purpose, prescription legend drug, possession of weapon while committing certain CDS crimes and possession of rifles and handguns on June 28. Zachary Bowen, 18, of Hamilton Twp.was arrested by Ofc. Kerry Baerman for possession of less than 50 grams of marijuana and drug paraphernalia on June 28. Gerald Alvarez, 21, of Hamilton Twp. was arrested by Ofc. Przemyslaw Ryba for possession of drug paraphernalia and an open alcoholic beverage in vehicle on June 28. Travis Wilson, 20, of Port Republic was arrested by Ofc. Bill Schroer for DWI on June 29. 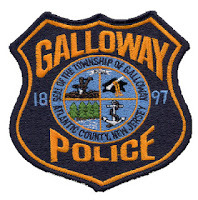 Per Galloway Township Police Department, persons listed here as arrestees are considered innocent until or unless otherwise adjudicated otherwise in court.